Section 6 Class D Champions !!! 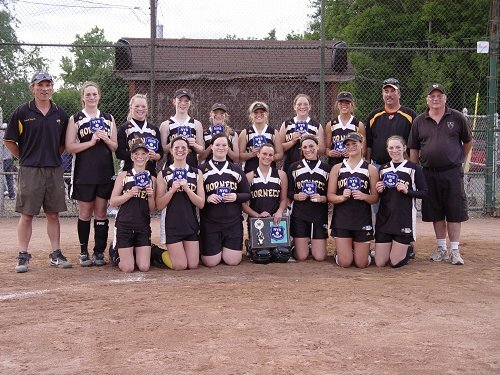 The FCS Lady Hornet softball team captured the 2009 Section 6 Class D championship on Friday, June 5th as they beat #1 seeded Ripley Lady Eagles, 7-2! The Lady Hornets advanced to the Far West Regional game on June 9th versus Section 5 champion, Batavia-Notre Dame, and unfortunately lost a close battle 1-0. However, the 2009 season is believed to be a record setting one as the 22-3 Lady Hornets finished ranked as the #4 team in the New York State Class D poll. Many Lady Hornets were honored with post-season all-star honors. Senior - Chelsea Mead, and Junior - Kerrin Murphy, were also named to the All-State team. and the 2009 Lady Hornets !! !